The DISC online assessment is a resource that helps nonprofit leaders use powerful behavioral profiling skills to directly improve performance and increase productivity. The assessment results empower you to communicate better with other people in order to drive fundraising results, build a more cohesive team, improve hiring, empower board members as well as volunteers. AAA, Astra Zeneca, Blue Cross Blue Shield, Boeing, Boston Scientific, Butler University, Cardiovascular Institute of the South, Cargill, East Carolina University, Estee Lauder, ESPN, Federal Reserve Bank of San Francisco, GE, Hugh Baird College, John Deere, Kaiser Permanente, M.D. Anderson Cancer Center, MetLife, Microsoft, Newcastle University, Philips Healthcare Systems, Pinellas County Schools, Price Waterhouse Coopers, Purdue University, Samford University, Schering Plough, Sprint Corporation, St. Edwards University, St. Jude Medical, Tufts University, UNLV, University of Indianapolis, Verizon Wireless, YMCA. People prefer to interact with people they know, like, and trust. The ability to create rapport is a fundamental skill in fundraising, management, executive-level leadership and everyday life. The goal of DISC is to help nonprofit professionals first build, then maximize productive relationships. You do not have to change your personality; you simply need to recognize what drives other people and understand your options for effectively communicating with them. 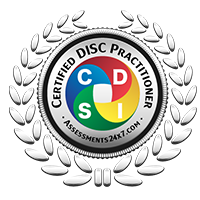 Our DISC report (click here for a sample) will help you learn specific skills and techniques you can put into action right away to improve your interpersonal relationships and effectiveness. The DISC Report and Executive Coaching Debrief will help you better understand your natural behavioral style and impact on others who may have a different style. You will be empowered with specific recommendations unique to your individual profile come away with effective strategies for immediate results. Managing relationships may well be the single most important challenge that leaders face. Using the powerful DISC tools, you will work with your coach to discover your motivations and behaviors that impact how you lead. And, by understanding why you behave as you do, you will learn how to influence others who think, behave and communicate differently from you.